U.S. Secretary of State John Kerry urges Egypt's interim rulers not to extend the state of emergency when it ends later this month. 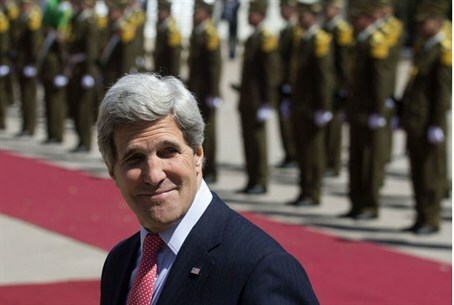 U.S. Secretary of State John Kerry on Sunday urged Egypt's interim rulers not to extend the state of emergency when it ends later this month, a senior American official said, according to AFP. "He pressed hard on not extending the state of emergency when it expires on November 14," a State Department official told reporters travelling with Kerry. "He said that the crackdown that was underway was inappropriate and inclusivity required that there be an outreach to the Muslim Brotherhood and others," the official added. Egypt's interim president Adly Mansour told Kerry he had not really used the powers afforded under the state of emergency other than to impose a night-time curfew, the official said, according to AFP. Although there was no commitment on what the Egyptian government would do, the official said that "the language was positive." The state of emergency was declared on August 14, the day the army -- which had installed an interim government -- dispersed two Islamist protest camps, killing hundreds of protesters. In September, Egypt extended it by two months, raising the ire of the United States, which urged Egypt to lift the state of emergency and pressed it "to create an atmosphere where Egyptians on all sides can peacefully exercise their right to freedom of assembly and expression." According to AFP, Kerry also called on Egypt's interim leadership, following the army's July 3 ouster of Islamist president Mohammed Morsi, to work for greater inclusivity and to protect rights and freedoms. During his visit to Egypt, Kerry also met with Egypt's Foreign Minister Nabil Fahmy, and said that the freezing of aid to Egypt by the United States is not meant as a “punishment” by Washington. At a joint press conference with Fahmy, Kerry said that the two countries enjoyed good relations regardless of issues of monetary assistance.